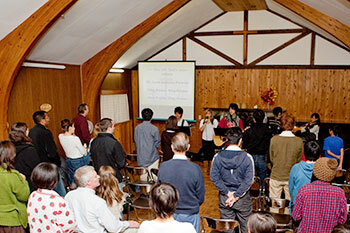 Karuizawa International Fellowship (KIF) is a group of believers from several different countries who meet, encourage one another and worship God in English. KIF meets weekly on Sunday at 15:00pm, at the former language school on KUC property, throughout the year except for the time when Karuizawa Union Church has services in the summer. KIF welcomes new visitors and old friends to stop in and be part of our family in Christ in Japan. "Now, therefore, you are no longer strangers and foreigners, but fellow citizens with the saints and members of the household of God, having been built on the foundation of the apostles and prophets, Jesus Christ Himself being the chief cornerstone, in whom the whole building, being joined together, grows into a holy temple in the Lord, in whom you also are being built together for a habitation of God in the Spirit."